ATV is a public company which, under agreement with the Independent Television Authority, provides the television programmes in London on Saturdays and Sundays and in the Midlands from Monday to Friday. ATV House, 17 Great Cumberland Place, London W.1. ATV House, 150 Edmund Street, Birmingham. JM Barham, FCA (Secretary); B Bibby (Production Facilities Controller); P Dorté, OBE (Midlands Controller); JF Gill, FCA (Group Accountant and Treasurer); M Gumpel (Director of Business Affairs); PJ Henry (Sales Director); L Lewis (Administration Controller); TC Macnamara (Technical Controller); S Mitchell (Chief Press Officer); K Rogers (Operations Controller); W Ward (Productions Controller). The Rev. John Bebb (Roman Catholic); The Rev. Stephan Hopkinson (Anglican); The Rev. Caryl Micklem (Free Church). Sir John Materman (Chairman, Education Advisory Committee); James Cochrane Wykes (Senior Education Officer); W Hemingway (Schools Liaison Officer). Total members of staff 1,379 (excluding ATV’s subsidiary companies). Production 622, Administration 289, Engineering 213, Sales and Research 83, Operations (presentation and films) 89, Accounts 62, Press and Public Relations 21. In addition, ATV employs some 3,300 artistes each year, as well as musicians and scriptwriters. A limited number of tickets are available for audience shows. Applications, enclosing stamped addressed envelopes, should be made to the Ticket Office Supervisor, ATV Studios, Elstree, Borehamwood, Herts. The minimum age is sixteen. Enquiries about artistes and programmes should be addressed to Viewer’s Correspondence, at ATV’s London or Midlands offices. Material required: 60-minute plays. These should be complete dialogue script of first form. Six- or seven-part children’s serials: completed dialogue script of first episode and detailed synopses of the remainder must be submitted. Unless Associated TeleVision has knowledge or experience of the writer’s work, no other form of submission will be considered. 30-minute situation and domestic comedies and documentaries are also in demand. There is very little demand for short plays, musicals, quiz games, panel shows, short stories and talks. All submissions should be addressed to The Script Editor. TV Times publishes separate editions for the London and Midlands areas giving details of the available programmes. ELSTREE STUDIO CENTRE, Borehamwood, Herts (Elstree 6100). This 340,000 sq. ft. development is one of the most up-to-date centres of television production, studio and technical facilities. The working floor area of the studios total 31,680 sq. ft. as follows: Studio A, 80′ × 80′; Studio B, 84′ × 80′; Studio C, 116′ × 80′; Studio D 116′ × 80′. The technical facilities directly associated with these four studios total 26,736 sq. ft. Other premises include Studio Facilities (75,790 sq. ft.), Technical Facilities (20,043 sq. ft.), Transport and Workshop Facilities (40,951 sq. ft.), Administration and Rehearsal Rooms (81,500 sq. ft.) and Restaurant (16,500 sq. ft.). WOOD GREEN TELEVISION STUDIO, Wood Green Empire, N.22. Working floor area some 4,250 sq. ft. Particularly suitable for large-audience shows with seating for 600. FOLEY STREET (Britallian House) London W.1, containing ATV’s Master Control centre and a small studio of 814 sq. ft. used for presentation and some discussion programmes. ALPHA TELEVISION STUDIOS, Aston, Birmingham, are owned jointly by ATV and ABC Television Ltd. There are three studios of 3,000 sq. ft., 1,200 sq. ft. and 380 sq. ft.
A great deal of the equipment installed in ATV’s Studios is fully transistorised. This includes pulse and vision distributing equipment employing semi-conductors throughout, and fully transistorised sound equipment. The studios are equipped for 405, 525, and 625 line standards. 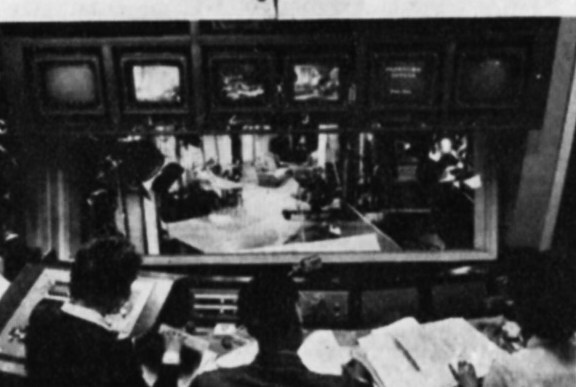 ATV has four mobile control rooms, each with four cameras, and an additional two-camera unit. One of these control rooms is used in conjunction with a video-recording vehicle to form the International Mobile Recording Unit. ATV Productions include: News and News Magazines: Midlands News; Midland Montage; On the Braden Beat. Talks, Discussions and Documentaries: The Warning Voice; Dinner Party; Midland Farming; Midland Profile; special documentaries; Meeting of Minds; Forum; Look Around the Midlands. The Arts: Sir Kenneth Clark series. Science and Natural History: Threshold; It Can Happen Tomorrow; The Wonder of Man. Religion: About Religion; Church Services; Epilogues; A Box of Birds (for children). Children: drama serials; Seeing Sport; I Am Going To Be… Schools: French from France, Ici la France, Summing It Up, Auf deutsch, Chemistry for Sixth Forms. Adult Education: Mesdames, Messieurs… Plays and Drama Series: Drama ’63; regular contributions to the Play of the Week and Television Playhouse series; Emergency Ward 10; Harpers West One; Deadline Midnight; The Plane Makers. Variety, Light Entertainment and Music: Sunday Night at the London Palladium; Bruce’s Show; Startime; Arthur Haynes Show; Hancock; The Morecambe and Wise Show; Tommy Steele Show; Roy Castle Show; A Golden Hour. Entertainment Films: many TV film series produced by or in collaboration with ATV. Sport: wide sports coverage, especially on Saturday afternoons.